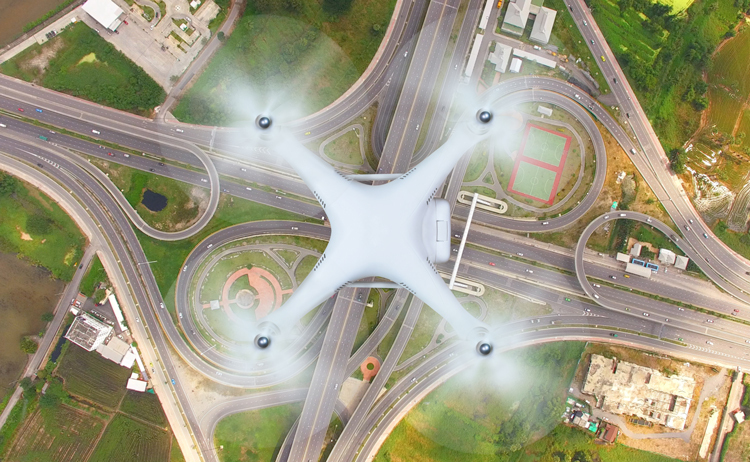 Columbus, Ohio — DriveOhio, the state’s new center for coordinating smart mobility initiatives, announced plans to study the use of unmanned aircraft systems (UAS) to monitor traffic and roadway conditions from the air along the 33 Smart Mobility Corridor. The three-year, $5.9 million study is a partnership between DriveOhio’s UAS Center and The Ohio State University College of Engineering. “At DriveOhio, we are looking for innovative ways to integrate technology into our transportation systems. This project will help us explore the intersection between autonomous and connected vehicles on land and in the air. The goal is to understand how we can better manage traffic, roadway incidents, and roadway conditions using advanced technology and data analysis,” said Jim Barna, Executive Director of DriveOhio. This research will include both air and ground vehicles and will complement ongoing work to test autonomous and connected vehicles along the 33 Smart Mobility Corridor, a 35-mile stretch of U.S. 33 between Dublin and East Liberty. Unmanned aircraft will monitor traffic and incident response along the corridor in conjunction with the state’s current fixed-location traffic camera system. The aircraft will interact with sensors and communication equipment along the corridor to feed data into the state’s Traffic Management Center. The project will also use sensors and communication devices to ensure the unmanned aircraft will not collide with each other or with manned aircraft, such as small planes and helicopters, that also use the lower altitude airspace. It is estimated that as many as 5,000 manned aircraft are in the sky at any given time. The project team will be led by DriveOhio and The Ohio State University’s College of Engineering in conjunction with Cal Analytics, Gannett Fleming, AiRXOS (a GE venture), Gryphon Sensors, Transportation Research Center, Inc., Woolpert, The Ohio State University Airport, and Midwest Air Traffic Control. The three-year research project is set to begin July 1, 2018. DriveOhio was created by Governor Kasich on January 18, 2018, as a center within the Ohio Department of Transportation that brings together those who are responsible for building infrastructure in Ohio with those who are developing the advanced mobility technologies needed to allow the state’s transportation system to reach its full potential. DriveOhio’s UAS Center is the premier unmanned aircraft support agency for the State of Ohio. The mission of the center is to support flight operations for local, state, and federal government and agencies. For more information on DriveOhio’s air and ground smart mobility efforts, visit http://drive.ohio.gov.